This full day tour of Paris includes the very best of the city! On this tour you'll visit at the Louvre and Notre-Dame Cathedral, take a scenic cruise down the Seine and enjoy a delicious lunch at The Eiffel Tower with amazing views over the city. The best thing is that you get to skip all the regular long entrance lines and maxisme your time in Paris. Because all monuments visited on this day’s excursion are located along the Seine, we'll be using an unusual means of transport: The River Shuttle. 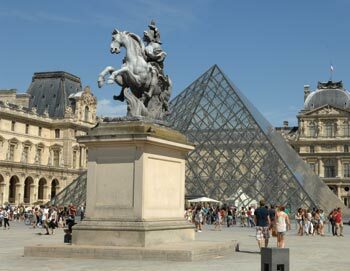 The day is kicked off with a guided visit of the Louvre Museum, where you'll get to see some of the most important pieces, including Venus de Milo, the Winged Victory and of course the world-famous painting of the Mona Lisa by Leonardo da Vinci. Next the river shuttle takes you on a trip down the Seine. Just sit back and enjoy the view of many of Paris' beautiful monuments en route to the Eiffel Tower. Once you arrive at the Eiffel Tower, you'll skip the line and go directly up to the 1st floor where your 2-course lunch (drinks are included) will be served. After lunch you'll hop back on the river shuttle again and head to the Notre Dame Cathedral. Here you'll enjoy a guided tour of this gothic work of art built between 1163 and 1345. The tour ends at the Notre-Dame, where you can continue to explore Paris on your own. Please be there 30 minutes before your tour starts. The tour ends at Notre-Dame. The tour lasts 7½ hours.